Whistler Ski Area is Almost Impossible to Imagine! Whistler ski area is easy to say. But it is so very beautiful and vast you really must see it to put it into the right perspective. Another way to see the mountains is to ride the gondolas up to the mountains and walk or ski around. To experience every trail run in a week you would need to ski 30 trails each day. Let’s look at it this way. Whistler ski area, if it were a country would be larger than Vatican City, Monaco and Nauru (south sea island country) combined, with plenty of acres left over. Imagine if you will, a neat little house with a nice green lawn, flower beds and a beautiful rose bush with American Beauty roses framing the home, on a city lot in Washington DC. Now imagine a solid row of identical houses stretching from that little home in Washington, all the way to Peoria Illinois, a distance of 714 miles. That is the size of the Whistler ski terrain available. The more than 200 runs on the two mountains take skiers all over the ski area. Beautiful little valleys, wide open areas way up there well above the tree line. Each run is unique. At this junction, a skier may plunge down a diamond run or opt for the easier 11 km (6.5 mile) long intermediate run to the right. An extensive inventory of top quality skis and boots await skiers at Whistler ski rental shops. The whole family can be outfitted. Of course they carry snowboards and gear as well. More than 9.14 meters (30 feet) of snow falls on whistler each year, beautifully plastering the trees as in this photo. No less than 34 lifts take skiers up and away quickly, this avoiding long line-ups. You ski down a nice run, spot a lift with a bit of a line-up. No problem. Simply continue to the nest one. They appear to be everywhere. Of course there are plenty of shops who sell and rent ski and snowboard equipment. Click here to view the ski equipment guide before you shop. 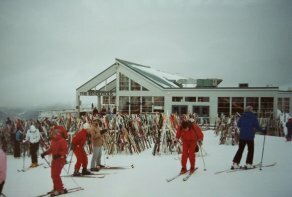 The restaurants are very popular on the mountains. You should have some way to identify yours. This photo shows how that might be a problem. 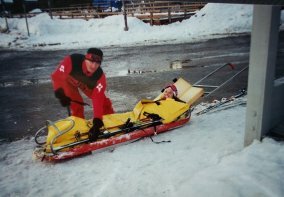 Of course skiing may be hazardous at times. Our daughter was enjoying herself here. We were not sure what really happened. Possibly she only wanted a lift to the base by the cute ski patrol person. 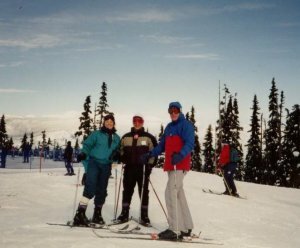 Of course, if your family is similar to ours, we love to meet and socialize and what better place to do so than the Whistler ski area trails. Words alone cannot describe the mountain layout. There is a wonderful whistler ski map available. One for the adults Click here to view the mountain map for adults. Whistler operates from late November to late June. Glacier skiing runs until Late July. Blackcomb mountain has a vertical drop of 5,280 feet, the highest in North America. Whistler mountain has a vertical drop of 5,020 feet. If you are feeling a little timid about your skiing abilities, and possibly thinking a whistler ski vacation may be a little too daring for you, never fear. 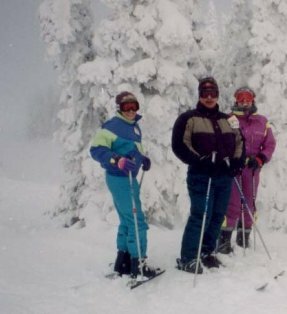 My wife Irma and I had very little ski experience at first. Especially Irma. An hour on the bunny hill and I talked her into trying one of the easy beginner slopes. In no time she loved it. We were both 56 years young at the time. Whistler ski area. You will love it and it will love you. Don't miss this page on back-country skiing and hiking. 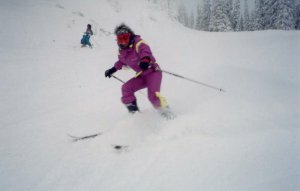 Telemark Skiing. For those who pursue off trail Mountain Passion.